Turmeric root has been used for over 4000 years to support a healthy lifestyle. Now you can enjoy the benefits of Organic Turmeric in an easy and convenient capsule. Bioglan Superfoods Organic Turmeric Capsules are rich in Vitamin D which contributes to the maintenance of normal bones, muscle function and helps to support the immune system. 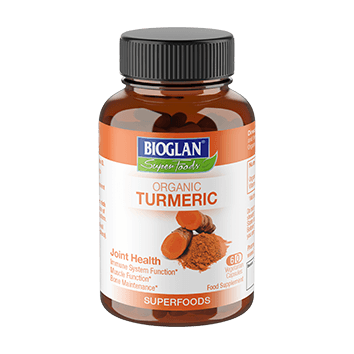 Take 2 capsules per day with water and feel the benefits of Bioglan Superfoods Organic Turmeric for yourself. Turmeric contains compounds called curcuminoids, the most important of which is curcumin which is the main active ingredient in turmeric. It has powerful anti-inflammatory effects and is a very strong antioxidant which has traditionally been used in Ayurvedic medicine for its pain killing properties. Bioglan Superfoods Organic Turmeric Capsules are rich in Vitamin D which contributes to the normal function of the immune system. Inflammation is the cause of many chronic diseases and the curcumin in turmeric helps to combat inflammation. Turmeric, is also anti-viral and anti-fungal, helping to support immunity. A rich source of Vitamin D, Bioglan Superfoods Organic Turmeric Capsules contribute to the maintenance of normal bones and muscle function.